For the longest time, I have been brewing my coffee in the keurig (we have this one). I use either Starbucks Breakfast Blend or Donut Shop Original, something a little bit on the strong side but nothing flavored. I brew the coffee directly into a metal mug or cocktail shaker so I can put it right into the freezer. I use the medium cup setting, so it is a little bit stronger & let it sit in the freezer to cool off for about 5-10 minutes. Then, I pour it over ice & add half & half. Seriously, too easy right? 🙂 I prefer my coffee unsweetened, even a little on the bitter side, but you can always add sweetener, flavored creamers or even honey if you prefer. Recently, I discovered cold brew coffee. I picked up a bottle of the Trader Joes brand & have been experimenting with it to find the perfect way to make it. I have become completely obsessed with it after finally mixing it right, definitely worth trying because it is just so easy & convenient! I think the trick is just adding enough water since it’s technically a concentrate, it all depends on how strong you like it. 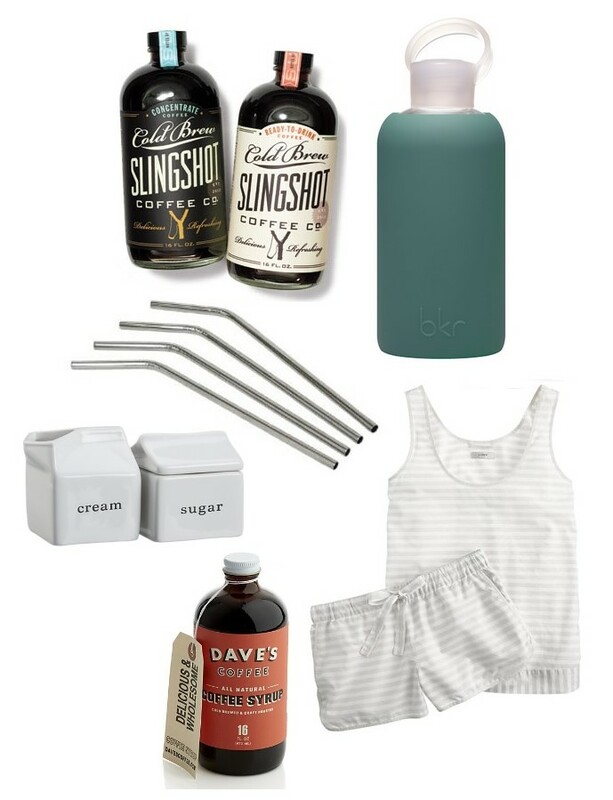 And for fun, a few cozy coffee picks, I am in love with those water bottles & they are perfect with a straw for cold coffee on the go! Do you have a magical iced coffee recipe worth sharing? Cheers, friends! Hope you all have a great day ahead!